- Laundry room: with washing machine, dryer, ironing board etc. Apartment completely renovated in May of 2011: everything is new, even the furniture! The center position does not exclude the peace and quiet of the house: but as soon as you leave the house in a few minutes you're already at the center of the world! Janiculum, one of the seven hills of Rome: It tells the story of ancient Rome. to see the historic center of Rome? Then walk a hundred yards and I am already immersed in the great history of Rome with all the beauty and comfort offered by this city!Rome was built by Romulus and Remus. Rome is located on seven hills: the Janiculum is one of the seven hills. The bottom of the hill Janiculum is built and you can choose one of these beautiful apartments. Or I go to visit the park of the Janiculum and the great Street Lungara Botanical Garden! You'll discover so many things to see that you will want to return to Rome. For this review, I was moved: my guests have all become friends! Assistance even after check-in! : Have you ever needed help from home? We hope you never have need of nothing. But if it happens? I have always intervened personally or with my other colleagues. To my knowledge, other Holiday not behave properly like me! Think about this possibility! And as a result you decide! English I bought three apartments that I use to Holiday because: a) Always dress in Rome b) is a good investment property in Rome aquistare c) why Rome, in Florence and Venice together possess 75% of the world's art treasures! d) because Rome is a beautiful dream with open eyes, you never stop to discover Rome! e) I would say to tourists from around the world back to Rome when you can, every time you return and find treasures nnuovi corners that will make you love this city like we love the Romans! Italiano Ho acquistato tre appartamenti che utilizzo a Casa Vacanze perchè: a) abito da sempre a Roma b) è un buon investimento aquistare immobili a Roma c) perchè Roma, assieme a firenze e Venezia posseggono 75% dei tesori d'arte mondiali! d) perchè Roma è un bellissimo sogno ad occhi aperti; non si finisce mai di scoprire Roma! e) vorrei dire ai turisti di tutto il mondo: tornate a Roma quando potete; ogni volta che tornerete scoprirete tesori ed angoli nnuovi che vi faranno amare questa città come la amiamo noi Romani! español He comprado tres apartamentos que yo uso para vacaciones debido a que: a) Siempre vestido en Roma b) es una buena inversion en Roma aquistare c) ¿Por qué Roma, Florencia y Venecia en conjunto poseen el 75% de los tesoros artísticos del mundo! d) porque Roma es un hermoso sueño con los ojos abiertos, nunca dejas de descubrir Roma! e) Le diría a los turistas de todo el mundo a Roma cuando se puede, cada vez que regresa y encuentra tesoros esquinas nnuovi que te hará el amor a esta ciudad como amamos a los romanos! Française J'ai acheté trois appartements que j'utilise pour vacances, parce que: a) Toujours robe à Rome b) est une propriété bon investissement à Rome aquistare c) pourquoi Rome, à Florence et à Venise ensemble, possèdent 75% des trésors d'art du monde! d) parce que Rome est un beau rêve les yeux ouverts, on ne cesse jamais de découvrir Rome! Few words, but good! a) live in a house in the center of Rome, where even on foot you can reach the most famous and most interesting of this wonderful city b) two hundred meters, the parking Gianicolo, you can get on two buses: 115 and 116, you can go anywhere with these two bus! c) This apartment was completely renovated recently in plants, a modern heating system ensures maximum comfort in summer (air conditioning in every room) and in winter, always with a controlled heating in every room d) Many large windows provide exceptional brightness time. f) are new beds with orthopedic mattresses g) a comfortable sofa and chair provide for optimum relaxatioand an incredible view of Castel Sant'Angelo and the Dome of the Church of the Florentines. e) The kitchen is fully equipped with stove, sink, refrigerator, freezer, microwave and full optional, allows you to wash the laundry area (washing machine) and dry (dryer) and iron (iron and ironing board) in a very short n and a comfortable reading. h) a high-speed Internet, wired and WiFi (along with a printer / scanner) allows connection to any work or leisure. i) a TV with Satellite dish, you can connect with news from around the world. l) on request I can provide a mobile card phone Italian. SAFETY FOR DEPOSIT! The deposit for the reservation can be made into the PayPal account of the owner, Rodolfo Todini: rodolfo_todini@alice.it You can use any credit card. This system ensures maximum safety for tourists. In fact, at any time, tourists can exercise its right to ask the clause PayPal Chargeback! toilet, shower, bidet, The two bathrooms are complete with everything! Two comfortable and spacious bathrooms with toilet, bidet, shower, wardrobe and heating. Appartamento molto centrale: 4 minuti a piedi per il Vaticano! at 150 meters (yards) cross the Tievere river. Five fan coils and a state-of Daikin air conditioning ensure a comfortable and constant temperature at all times: 24 hours 24 hours! A gas boiler enclosure (maximum security) to ensure a constant temperature and condensation adjustable in any environment, even in the bathrooms! The apartment is complete and habitable like your home! It is supplied with towels for the bathroom and sheets and blankets for the beds. in this apartment you find a room used as a laundry: where you find the washing machine and the dryer and an ironing board with an iron. And it is exclusive for this apartment. Microwave-art oven and you can cook anything you want! We provide two cars Italian espresso! The tap water in Rome you can drink! The kitchen is fully equipped super! Stove, microwave. dishwasher, fridge, freezer, washing machine and dryer! the kitchen and the whole apartment is reserved exclusively for you! Monument View. we can supply mobile phone. The apartment enjoys a great view, bright, unique decor, four single beds or two double beds (customer's choice), printer / scanner system, full-featured microwave oven, refrigerator and freezer, two bedrooms with two bathrooms complete with shower and toilet / bidet, and fire alarm phone call with customizable, tinted double glazed windows, air-conditioning (and heating) with temperature control in any environment. This apartment is located at the beginning of the small Gianicolo (Rome was built 2000 years past seven small mount!). The Gianicolo is a big huge, beautiful garden of Rome! Where you can make beautiful walks in the park and tranquility! And all this just a few hundred meters from the center of Rome, from the picturesque Trastevere, Piazza Navona and the Vatican and St. Peter's Basilica! Three of us stayed at Rodolfo's charming apartment Oct 15-22, 2018. So clean, extremely well appointed, we did not lack for anything. We had wifi, an excellent kitchen, washer and dryer and really comfortable beds; it was perfect. Rodolfo stayed in touch with us in advance of our stay and Iryna met us and walked through the apartment details with us and was very helpful. We walked to everything - St. Peter's, Vatican, Pantheon, Navona, Spanish steps, etc. Great restaurants were within walking distance. We also found well stocked grocery stores and had fun shopping and preparing some of our meals at home. We would definitely stay here again and will recommend it to our friends and family. We are appreciative of Rodolfo and the level of service he provided to us. We will never forget. Good morning and thank you Joseph. What else can I add? That all our efforts to provide maximum comfort to our guests has been rewarded! The owner Rodolfo todini thanks! Beautiful Apartment! Close to Vatican. This beautiful apartment was very enjoyable. It was perfect for 4 people. Included a full size refrigerator, stove microwave, washer and dryer. We appreciated having hair dryers in each bathroom. Shirley and Iryna were great giving us directions for the use of the apartment. They also gave us information on using the buses and subway. Even ordered taxis. They were very helpful! Thanks Janice. Our efforts to provide maximum comfort to our customers have been rewarded! Still a dear guest who tells us: "We had a lovely stay in true home away from home!". This answer is the best we can expect! Thank you again. - Panoramic apartment, very bright, quiet, quiet and central! - Laundry: washing machine, dryer, iron and ironing board, etc. - Fast, wired and Wi-Fi Internet; printer, scanner. - The apartment has been completely renovated in May 2011. Merci Janice. Nos efforts pour offrir un maximum de confort à nos clients ont été récompensés! Encore un cher invité qui nous dit: "Nous avons passé un séjour très agréable dans une vraie maison loin de chez nous!". Cette réponse est la meilleure à laquelle nous pouvons nous attendre! Merci encore. - Appartement panoramique, très lumineux, calme, calme et central! - Blanchisserie: lave-linge, sèche-linge, fer et planche à repasser, etc. - Internet rapide, câblé et Wi-Fi; imprimante, scanner. - L'appartement a été entièrement rénové en mai 2011. The flat is pleasant to live in and this duplex appartment help to respect individual privacy. It is also really well located : easy walking distance from the main monuments to visit. Rodolfo is as available as obligeant, and her collaborator Shirley is very nice. Our stay was perfect. A quiet place to recommend! Thanks Karine. I'm glad you enjoyed this lovely apartment! "We had a lovely stay in true home away from home!". To have the impression of being in your own home ... but far from home! Our goal is reached! Our guests must feel at home! Very central apartment: on foot you can reach many important tourist places. Esempoi: 4 minutes walk to the Vatican! Bright, panoramic, two bedrooms and two bathrooms with shower. Super-equipped kitchen, Lavaneria with washing machine and dryer. Dining table, sofa and armchair. Independent heating, air conditioning, WiFi Free. Customized check-in, assistance before, during and after check-in. The owner Rodolfo Todini thanks. Merci Karine. Je suis content que tu aies apprécié ce bel appartement! "Nous avons passé un séjour très agréable à la maison loin de chez nous!". Avoir l'impression d'être chez toi ... mais loin de chez toi! Notre objectif est atteint! Nos invités doivent se sentir chez eux! Appartement très central: à pied, vous pouvez rejoindre de nombreux lieux touristiques importants. Esempoi: 4 minutes à pied du Vatican! Lumineux, panoramique, deux chambres et deux salles de bains avec douche. Cuisine super-équipée, Lavaneria avec lave-linge et sèche-linge. Table à manger, canapé et fauteuil. Chauffage indépendant, climatisation, WiFi gratuit. Enregistrement personnalisé, assistance avant, pendant et après l'enregistrement. Le propriétaire Rodolfo Todini remercie. Gracias Karine. ¡Me alegra que hayas disfrutado de este encantador apartamento! "¡Tuvimos una estancia encantadora en un verdadero hogar lejos de casa!". Tener la impresión de estar en tu propia casa ... ¡pero lejos de casa! Nuestro objetivo se alcanza! ¡Nuestros huéspedes deben sentirse como en casa! Apartamento muy céntrico: a pie se puede llegar a muchos lugares turísticos importantes. Esempoi: 4 minutos a pie hasta el Vaticano! Luminoso, panorámico, dos dormitorios y dos baños con ducha. Cocina súper equipada, Lavaneria con lavadora y secadora. Mesa de comedor, sofá y sillón. Calefacción independiente, aire acondicionado, WiFi gratis. Check-in personalizado, asistencia antes, durante y después del check-in. El propietario Rodolfo Todini gracias. Our overal experience was really bad. From the beginning, two days prior to arrival while we were traveling in other parts of Italy, Rodolfo wrote us to say that if we did not get back with him right away that there would be no one to meet us at the rental for "hours". I did get back to him right away and someone did meet us at the unit and supposedly explained how to use everything. Well, the day we checked out he wrote us another email that we had tampered in some way with his air conditioning system which I would have no idea how to do anyway. In an attempt to be helpful my wife washed some of the towels and a sheet prior to departure. He wrote in his nasty email how we had no authorization to do that. She does this quote often in the rentals we stay in just to be helpful and it is always met with appreciation and in more than one occasion we have be refunded our cleaning deposit entirely because we leave things very nicely upon departure. He accused us of not cleaning the filter on the dryer which we did do every time we used it and also not emptying out the water tank (which no one told me we need to do or how to do it) We have stayed in multiple rentals in multiple countries and have never been treated so poorly. Our kids were hot upstairs every single night to the point of using two fans (which each had a one hour timer) so they would wake up hourly so hot and sweaty every hour!! Additionally, the person that checked us in tried to make us sign a contract in Italian, which after looking at the english translation, had charges that were never part of the agreement. I refused to sign simply because I do not read or speak Italian so I would be signing something I had no idea what it said. The location of the apartment is great and it is nicely appointed but the next time we are in Rome we will be looking for something more suitable and hopefully a less rude and more considerate person to rent from. Our family of four adults stayed at the condo for three nights in early June 2018. Arrival from the Fiumicino Airport was about 45 minutes and check-in/instructions with Irina was easy. The photos are misleading, the condo is small with no living room and if you use the kitchen table it blocks the stairs, but we were in Rome for the sights, not sitting inside so it was fine. We didn't use the kitchen to cook, just keep bottles of water, but the fridge didn't get very cold and the drawers had orange stains (yuck). Beds were comfortable; the 2nd floor twin beds are thin and very close together. Bathrooms have typical small European box showers but with good water pressure & hot water. There weren't enough towels for 4 people, especially after sweating all day and needing another shower in the afternoon (I didn't want to do laundry on my vacation! ), but we didn't want to be a bother and request additional towels so that's on us. The condo had air conditioning but the rental instructions had us shut off the power when we left each day so after a day in the heat it was inconvenient to wait for the unit to cool off. The rooms were "cool" but the 2nd floor was warmer, fans helped. When the windows are closed it's quiet but there is constant horn honking and ambulances day and night (city sounds), but if you open the windows you'll be rewarded with the smell of Jasmine from the neighbors. 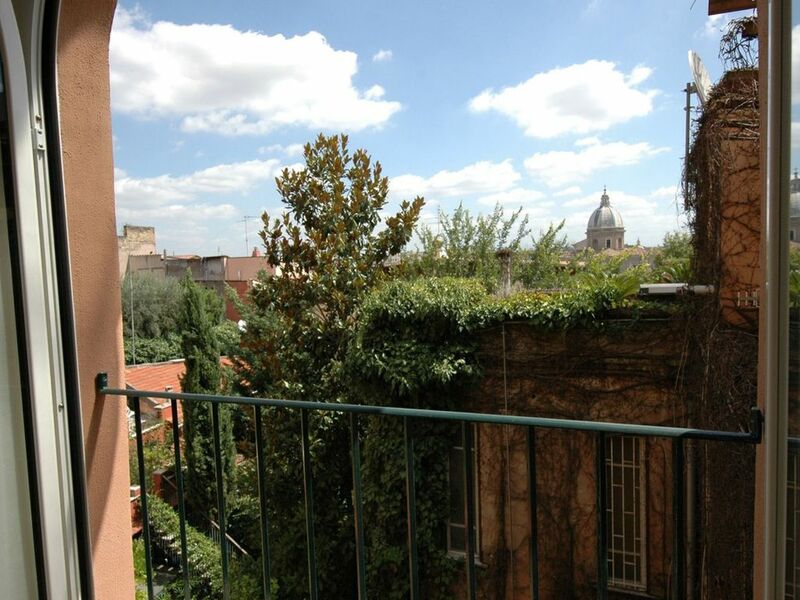 The condo is in close proximity to Castel Sant'Angelo, The Vatican and Janiculum for panoramic views. It's quite a walk to all the sites in Central Rome and the Colosseum. Be aware, the condo is on a hill and you will be walking up stairs and uphill on cobblestone streets; after long days of walking around Rome this gets tedious and kept us from doing some things we would have liked due to sore legs...even if you are in good physical shape. FYI, Homeaway only allows "I loved it" or "not really" as a choice to leave a review; while we didn't "love it" , we didn't hate it either. Overall the condo was fine, but next time I would stay in central Rome and only walk the Trestevere hill when and if I wanted to, not because I had to. Dear Michael, good morning. I do not share your review. I believe you must agree with yourself! That is, you need to know exactly what you want! The historic center of Rome is very large! This beautiful apartment is located in the old district that is the center of Rome: 5 minutes walk to get to the Vatican. Fifteen minutes on foot to get to Piazza Navona. If you want to be a tourist in Rome ... you have to walk, or get on the bus or taxi. This apartment has been refurbished to a very high standard and has a super-equipped kitchen: stove, microwave oven, dishwasher and a Siemens fridge! Maybe you did not know how to lower the temperature you wanted! You could call! The photos represent exactly the apartment! There is also a video to make it clear how the house is made, comfortable with two bedrooms and orthopedic mattresses, two bathrooms with shower! You did not say that there is a laundry room with a washer and dryer! Table and iron! The latest generation hydronic conditioning system is fully functional and after only 5/10 minutes it reduces the temperature of the house by at least 5/6 degrees ... pay attention to the cold! Many hospitals are concentrated in the historic center of Rome: it's better this way, if it were to serve ...! Perhaps the next time you come to Rome, look for a large apartment in the suburbs. In the morning when you go out, you can not walk to see the Vatican, Piazza Navona, Piazza Campo dei Fiori, the Pantheon, etc. .. You'll wait for the bus even 30/40 minutes, full of many people and after 20/30 minutes of travel you will arrive at your destination! Do you prefer this? The future customers who will read this answer I tell him to read the 60 reviews almost all 5/5. My husband and I and our 12 year old guest enjoyed our stay in Trastevere. The apartment was well suited for us, a loft bedroom and bath for the 12 year old and master bedroom and bath for us. The fact that we did not have to climb lots of stairs to get to the apartment was a plus. We were met at the apartment upon our arrival in Rome, so we were able to go from airplane to apartment immediately. The apartment was well equipped and clean, quiet and had a nice view out of the windows. We took advantage of the kitchen and had breakfast and dinner at home while we were there. I highly recommend this apartment for its appearance, location and owners hospitality. Thanks Julis you were brief but you described the situation of the house and the service in an exceptional way. I must add that the house is very, very central: 4 minutes walk to the Vatican! Gracias, Julis, fuiste breve, pero describiste la situación de la casa y el servicio de una manera excepcional. Debo agregar que la casa es muy, muy central: ¡a 4 minutos a pie del Vaticano! - Apartamento panorámico, muy luminoso, tranquilo, tranquilo y céntrico. - Lavandería: lavadora, secadora, plancha y tabla de planchar, etc. - Internet rápido, con cable y Wi-Fi; impresora, escáner. - El apartamento ha sido completamente renovado en mayo de 2011. Salita S. Onofrio is one of the ancient streets of Rome. This road is of extraordinary beauty takes its name from the church of Sant 'Onofrio, which is positioned at the end of this road. This road starts from along the Tiber to finish next to the church. This neighborhood, quiet and peaceful, is located on the Janiculum hill (the ancient Rome is built on seven hills). The Janiculum is a large park in the countryside. But we have to 50/100 meters all the shops we want: restaurants, bars, pizzerias and so on. The basilica of St. Peter's is a few meters. From the windows of this house you can see Castel Sant'Angelo (which was the refuge of Pope). This apartment was completely renovated in May of this year. So you live in a house with the comfort and then go out and find you already walk to the historic center of Rome! Golf: The most famous golf club in Rome is the Holy Water. It is about 7 / 8 miles. If a visitor wanted to get more news I'll put in touch with the direction delcircolo Holy Water. Ski: The nearest ski resort is in Rome and is about 100 kilometers Terminillo. But I do not think that anyone who comes to Rome in Terminillo wants to go skiing! Rome offers more and more beautiful things to see and do.